First step is sign yourself with the cross and then after you kiss the crucifix you then say the Apostle Creed which is said as below. I believe in God, the Father Almighty. Creator of heaven and earth; and in Jesus Christ, His only Son, our Lord, who was conceived by the Holy Spirit, born of the Virgin Mary, suffered under Pontius Pilate, was crucified, died and was buried. He descended into hell; on the third day He rose again from the dead; He ascended into heaven, and is seated at the right hand of God, the Father Almighty; from thence He shall come to judge the living and the dead. I believe in the Holy Spirit, the Holy Catholic Church, the communion of saints, the forgiveness of sins, the resurrection of the body, and life everlasting. Amen. Note: When we say I believe in the Holy Catholic Church, we are talking about the traditional teachings of the Orthodox Catholic Church. This new pope Francis is not recognised by God. I have heard it twice, once by a prophetess of the name Maria Divine Mercy, who was told the keys of the Vatican was returned to heaven when Pope Benedict resigned as Pope. And a young Spanish seer from Garabandal in 1961 was told by Our Lady how many more popes were to be before the end times and Mary said one of them she doesn’t recognised. Pope Francis is not teaching the true Catholic teachings at all, he is a danger to the church, but ultimately God’s people, the sheep of His flock will not follow him, because they will not recognise his voice as it is written in scripture. Jesus’s sheep will only recognise the voice of Jesus and it is Jesus we follow. 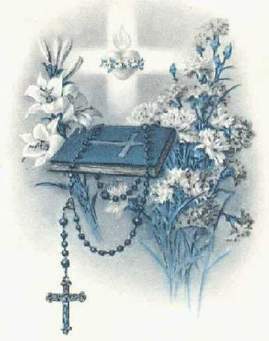 Now the next important prayer we use a lot in the Rosary is known by the Protestants as the ‘Lord’s Prayer.’ Catholics usually call it the ‘Our Father.’ In the Gospel the Lord’s Prayer is said twice. Catholics say the shorter version. 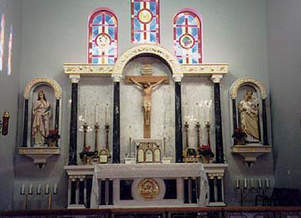 The Protestants will add ‘and Thine is the Kingdom and the power and the glory forever and ever. Amen. Catholics don’t say that. Neither are wrong it is just your preference the way you want to say it. Both versions are in the bible. Hail, Holy Queen, Mother of Mercy, our life, our sweetness, and our hope! To thee do we cry, poor banished children of Eve, to thee do we send up our sighs, mourning and weeping in this valley of tears. Turn then, most gracious advocate, thine eyes of mercy towards us; and after this our exile, show unto us the blessed fruit of thy womb, Jesus. O clement, O loving, O sweet Virgin Mary. Now the next step is, while we are saying the Hail Mary Prayers we are supposed to let our minds meditate on the mysteries of our Redemptions. I will write down the different mysteries in their order. 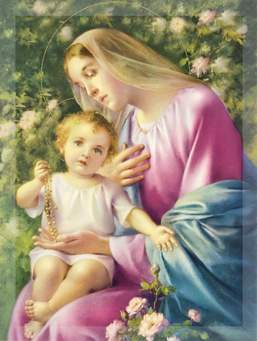 For the moment we are just getting all the prayers before you that you will need to know, to say the Rosary. In the next article we will have a much better idea how to use all this information. Note: I remember reading a book about Mary’s life by a visionary who was given the supernatural gift of seeing Mary’s life and she was shown; Mary had the opportunity not to die, because of how pleasing her life was to God. Even though she was given this opportunity she chose to die, because she wanted to resemble her Son as much as possible. The fourth Glorious Mystery the Assumption is saying she didn’t die, she just went straight to heaven. And yet at the same time there is a feast day where we celebrate Mary’s death. So there is a contradiction here. When I meditate on the fourth Glorious Mystery I just meditate on the joy everybody in heaven receiving her as she enters in heaven with her Son.